Patients with congenital heart disease (CHD) associated with increased pulmonary blood flow (Qp) have an abnormal growth and remodeling of the pulmonary vascular bed. The changes in the pulmonary vasculature become irreversible over time and eventually preclude surgical correction. The rate of progression to irreversible changes is often faster for complex forms of CHD associated with increased Qp such as single ventricle, transposition with ventricular septal defect (VSD), or persistent truncus arteriosus when compared to relatively simple shunt lesions such as VSDs and patent ductus arteriosus (PDA). Children with single ventricle and increased Qp typically need to undergo a pulmonary arterial band in the first few months to mitigate the early progression to irreversible pulmonary vascular obstructive disease (PVOD) and to keep pulmonary vascular resistance (PVR) at the lowest possible level to enable successful staged single ventricle palliation. Pulmonary venous hypertension (PVH) results from obstruction to pulmonary venous return from conditions such as cor triatriatum, supramitral ring, and mitral valve stenosis. These conditions may occur in association with other forms of CHD including those with single-ventricle physiology. This PVH contributes to pulmonary arterial hypertension (PAH) not just passively by elevating pulmonary venous pressures but also by inducing an additional element of pulmonary arteriolar vasoconstriction., This additional element may be reversible after correction of the substrate for PVH. We present two patients with single-ventricle physiology who had increased flow situation, along with PVH who presented late and in normal circumstances would not have been offered staged palliation. They underwent atrial septectomy and PA banding at the age of 9.5 years and 4.5 years, respectively. Both patients, however, had different outcomes with the patient who underwent PA banding at 9.5years successfully having a cavopulmonary shunt at the age of 12 years while the patient who underwent PA banding at 4.5 years remained pulmonary hypertensive and unsuitable for further palliation. A 12-year-old girl first presented at the age of 7 months with respiratory distress and cyanosis to her local hospital. She was referred to our center and had saturations of 81%. 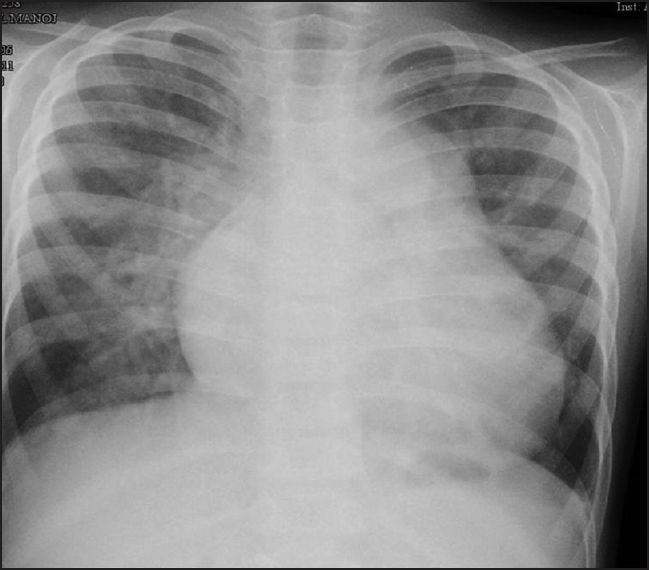 The X-ray showed cardiomegaly with increased pulmonary flow. Her echocardiogram (echo) showed that she had double inlet left ventricle (DILV) with an intact atrial septum, a supramitral ring, and trivial left atrioventricular (AV) valve leak. There was D-malposition of the aorta and both outflow tracts were unobstructed. The branch pulmonary arteries (PAs) were dilated. She was born at term by normal delivery to a mother with gestational diabetes and the postnatal period was uneventful. Her birth weight was 2.7 kg. The parents were not willing for further evaluation at the time of initial presentation and the patient was lost to follow-up until she presented again at 9 years of age with a left parietal lobe brain abscess. This was managed with a burr hole surgery and intravenous (IV) antibiotics. Her cardiac evaluation at the time showed that resting oxygen saturation was 93%. Her apex impulse was in the 6th intercostal space outside the midclavicular line. Cardiac auscultation revealed a single loud S2. There was a grade II ejection systolic murmur along the left parasternal border and a low pitched mid diastolic murmur at the apex. 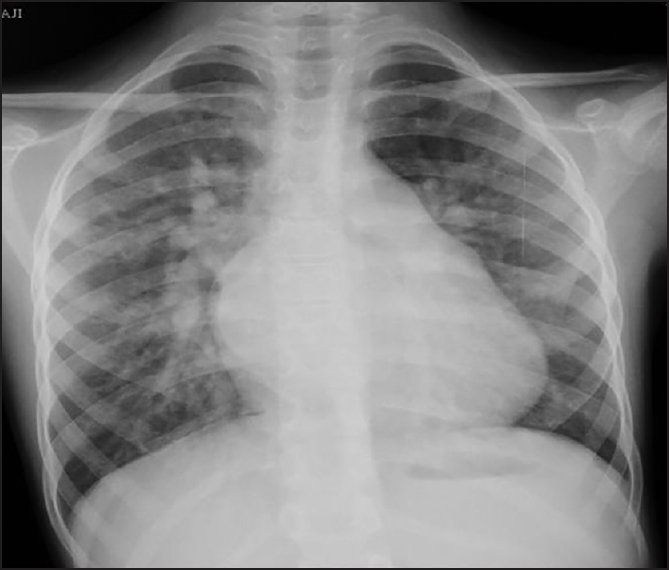 Her X-ray [Figure 1] showed cardiomegaly, elevation of the left bronchus, double shadow suggestive of left atrial (LA) enlargement with signs of PVH with prominent right PA. Her echo showed a supramitral ring with a dilated left atrium and interatrial septum bulging to the right. The peak gradient across the mitral valve was 14 mmHg and the mean gradient was 10 mmHg. Her main and branch PAs were significantly dilated and were completely unobstructed. Her clinical details were discussed once again at the joint cardiac conference with the surgeons and the plan was for her to undergo an atrial septectomy with a PA band [in view of the supramitral membrane, high saturations with significantly dilated main pulmonary artery (MPA) and branch PAs]. Cardiac catheterization was not undertaken prior to surgery. At surgery, it was noted that she had a normal situs, levocardia, D-posed aorta, and the MPA was four times the size of the aorta with an intact interatrial septum. She underwent atrial septectomy with PA banding at the age of 9.5 years. The chest was kept open immediately following surgery and the band was further tightened after 24 h and then the chest was closed. She was extubated on the 4th postoperative day. Her saturations in the intensive care unit (ICU) were in the low 90s and she was discharged after an uneventful stay. An echo performed prior to discharge showed a PA band gradient of 50 mmHg and her oxygen saturations were in the early 90s. The patient then presented when she was 11 years old with another episode of brain abscess (right basofrontal and left posterior). She underwent a neuronavigation guided burr hole placement and aspiration of both abscesses. She was also given IV antibiotics. Her cardiovascular assessment showed that she was symptomatically in functional class 2 (breathlessness on exertion) and her saturations were in the high 70s. An echo showed trivial right AV valve leak with a small left AV valve, an unrestrictive atrial septal defect (ASD) with a PA band gradient of 70 mmHg. Cardiac catheterization was performed and the hemodynamics is presented in [Figure 2]. Oximetry data suggested reduced pulmonary flow across the PA band with PA saturation higher than aortic saturation. Angiograms showed confluent and dilated branch pulmonary arteries. The Nakata index was 385.66 mm 2/m 2. The pulmonary venous return was normal on levophase with no evidence of pulmonary arteriovenous malformation. The clinical details were discussed at the joint cardiac conference and the plan was to go ahead with a cavopulmonary shunt as the next step after counseling the parents. The long-term plan was to completely palliate with a Fontan procedure at a later date, if suitable. She underwent a bidirectional cavopulmonary shunt and main PA ligation at 12 years of age. She was extubated on day 2 after surgery and discharged on postoperative day 14 with saturations of 80%. There was no chest tube drainage beyond the first 24 h. During the 6-month postoperative follow-up, she was relatively symptom-free with no facial swelling, no superficial vein engorgement, and her saturations were 82% in room air. An echo showed a functioning unobstructed Glenn and branch PA flows. There was mild right AV valve regurgitation. The aortic outflow was unobstructed with minimal antegrade flow through the pulmonary valve. She awaits a Fontan operation. An 8-year-old boy was first seen at 9 months of age. He was referred from another hospital where he was first diagnosed to have congenital cyanotic heart disease when he presented there with a respiratory illness. He was noted to be tachypneic [respiratory rate (RR): 50/min]; saturations were 86% and he had a loud second heart sound with a mid-diastolic murmur across the right AV valve. His echo showed that he had mitral atresia and a hypoplastic left ventricle. There was a 5.5-mm restrictive atrial communication shunting from left to right with the septum bulging to the right. There was a DORV with normally related unobstructed great arteries and an unrestrictive VSD. The right ventricular function was preserved with trivial tricuspid regurgitation. The branch pulmonary arteries were dilated and there was a large unrestrictive patent arterial duct with bidirectional flow. The arch was unobstructed. He underwent cardiac catheterization after he recovered from the respiratory infection. 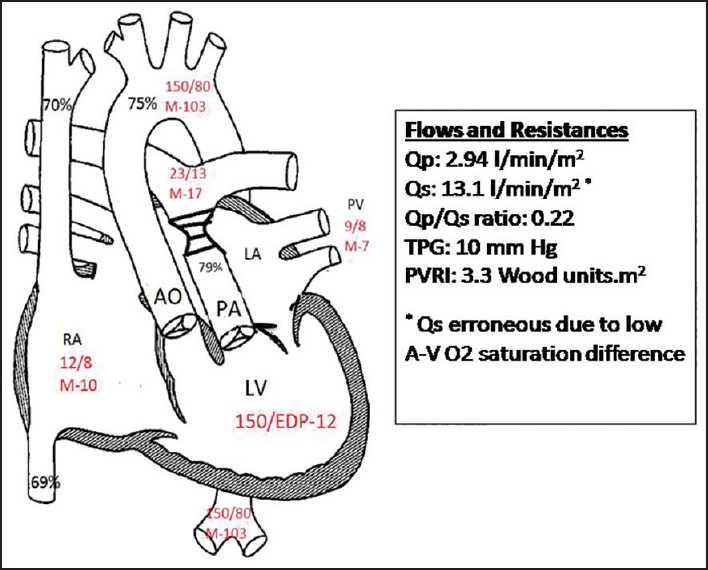 There was a mean gradient of 13 mmHg across his atrial septum with PVH [LA pressure: 34 mmHg]; Qp:systemic blood flow (Qs) ratio was 2.4:1 with pulmonary vascular resistance index (PVRI) 3.4 WU.m 2. He underwent a static balloon dilatation of the atrial septum with a 16-mm Tyshak II balloon and the mean gradient came down to 6 mmHg. The clinical details were then discussed at the joint cardiac meeting and a PA band with atrial septectomy and PDA ligation was recommended. The patient was lost to follow-up and presented again at the age of 1.5 years with failure to thrive and recurrent respiratory tract infections. His saturations were 88%. Auscultation revealed a single loud P2 and no S3 or murmur. He had a repeat cardiac catheterization at 1.5 years of age. There was a 13-mmHg mean gradient across the atrial septum that came down to 4 mmHg after balloon dilatation. He was commenced on diuretics and sildenafil after catheterization and later digoxin was added. The sildenafil was stopped after a brief period, as there was no clinical benefit. He was under follow-up after catheterization and his saturations were in the low 80s. He had a repeat cardiac catheterization at 4 years of age. This revealed elevated LA pressures (LA mean of 20 mmHg) and a 10 mmHg mean gradient across the atrial septum. The PA pressure was 110/60 (mean 78) mmHg and the aortic pressure was 110/64 (mean 80) mmHg. The Qp:Qs ratio was 2:1 and PVRI was 10.2 WU.m 2 with a PVR/systemic vascular resistance (SVR) ratio of 0.44. His X-ray [Figure 3] showed cardiomegaly, increased Qp with a prominent main and right pulmonary artery (RPA). His echo showed unobstructed outflow tracts with dilated branch PAs and a PDA. After discussion at the joint cardiac conference, an atrial septectomy with PA banding and PDA ligation was undertaken. He was 4.5 years of age at the time of surgery. At surgery, the PA was tense and three times the size of the aorta. The PA was banded to the size of the aorta. The PA pressure was 2/3rd systemic at the end of the procedure and saturation was 90%. The chest was closed. The patient was extubated on the 3rd day after procedure and discharged on the 20th postoperative day with oxygen saturations of 88% and a Doppler PA band gradient of 52 mmHg. On follow-up at the age of 5 years, his oxygen saturation was 87%. He was asymptomatic with a PA band gradient of 74 mmHg. His cardiac catheterization showed a high mean PA pressure of 25 mmHg (PVRI: 2.88 WU.m 2). Pulmonary vasodilator (sildenafil) was continued on follow-up. At his next follow-up at the age of 6 years, he was symptomatic with cyanosis on exertion and in functional class 2. His saturation was 85% and the PA band gradient was 100 mmHg. His cardiac catheter showed high mean PA pressures of 24 mmHg (PVRI: 1.9 WU.m 2). The timeline of major events until the age of 6 years is shown below [Figure 4]. He was seen again at the age of 7 years and his saturation was 90%. He was symptomatic with cyanosis on exertion and in functional class 2 (breathlessness on exertion). His PA band gradient was 110 mmHg. 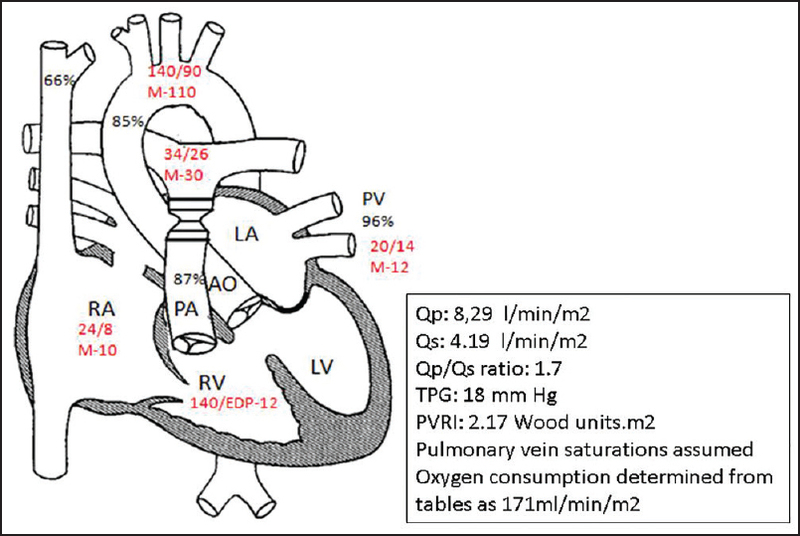 A cardiac catheterization was performed and the hemodynamic data are presented in the diagram below [Figure 5]. His mean pulmonary vein pressure was high (12 mmHg) and it was felt that this may have contributed to the high PA pressure. His pulmonary vasodilator therapy was hence, stopped. At the last follow-up when he was aged 8 years and 8 months, he was in functional class 2 and was getting increasingly blue with exertion. His oxygen saturation was 82% and his PA band gradient was 110 mmHg. His ventricular function was good with mild tricuspid regurgitation (TR). 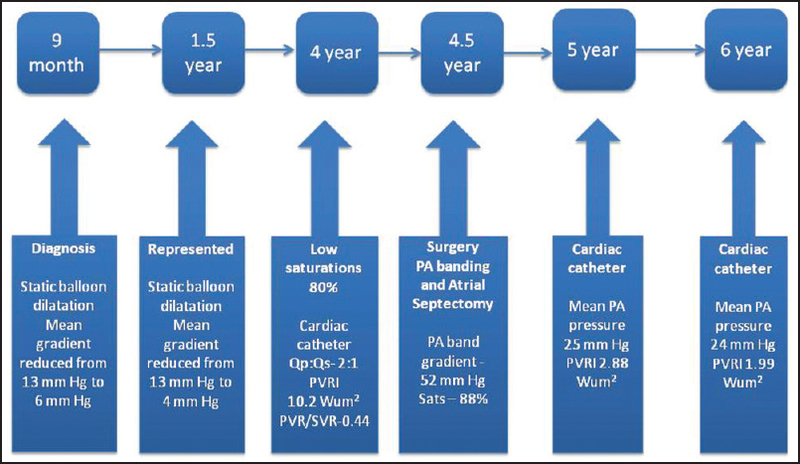 Another cardiac catheterization is planned to estimate PA pressures. Pulmonary hypertension can be the result of a variety of pathological processes. It can be secondary to increased pulmonary flow as in left-to-right shunts leading to PAH or can be as a result of left-sided obstructive lesions, which give rise to PVH that then secondarily predisposes to PAH., In complex CHD with left-sided obstruction and unobstructed pulmonary flow, there can be a combination of the two. Pulmonary hypertension is common in left-sided obstructive lesions. The presumed mechanisms include elevation of LA pressure and decreased compliance, which leads to passive PVH and reflex vasoconstriction of pulmonary arterioles. It is not clear whether permanent pulmonary vascular changes result from PVH alone. Longstanding PVH does lead to histological changes that include muscularization and neointimal changes of the distal pulmonary arteries., Thus, PAH may at least in part be reversible after correction of the substrate for PVH. There is limited data as to the effect on pulmonary hypertension after relief of left-sided obstruction in children with complex CHD. In observational studies in adults with rheumatic mitral valve stenosis and PAH who underwent balloon mitral valvotomy, serial catheterizations show an initial decline as a result of reduction of pulmonary venous pressures. The pulmonary pressures typically do not normalize immediately after the relief of stenosis. Over the next 6 months, there is a significant further decline that is presumably the result of a resolution of the pulmonary arteriolar vasoconstriction. Both our case scenarios included patients with complex congenital cyanotic heart disease with single-ventricle physiology who had a combination of increased Qp (precapillary), along with elevated pulmonary venous pressures (postcapillary). It is well-known that patients who have an increased flow to the lungs will develop PAH and increased PVR over time due to remodeling of the pulmonary vascular bed. The time period required for developing these changes depends on the amount of shunt, the level of the shunt, and the compliance of the pulmonary vasculature. Studies have shown that 15% of VSDs will have increased PVR by late infancy/early childhood and if repaired late, those with mild increase in PVR will have an abnormal degree of elevation of PVR with exercise. In admixture physiology as well for example in transposition of great arteries (TGA) with ventricular septal defect (VSD) or PDA, there will be a severe elevation in PVR in 40% by the first year of life and in 75% by 2 years. Our first patient presented again at the age of 9 years with high saturations and PA pressure due to unobstructed pulmonary flow and PVH secondary to the supramitral membrane. An atrial septectomy with a PA banding was performed to relieve the PVH and protect the lungs. On follow-up, she was symptomatic with low saturations. The catheter hemodynamics suggested that she was suited for a cavopulmonary shunt [Figure 2] that was subsequently successfully undertaken. The uneventful recovery that followed perhaps vindicated our preoperative assessment. Her follow-up has thus far been uneventful suggesting that the PVR is low. We would eventually plan a repeat cardiac catheterization and consider conversion to a Fontan operation. Our second patient had severe PVH and an increased pulmonary flow. His catheterization data showed an elevated LA pressure with a diastolic pressure gradient (DPG) of >7 mmHg and high PVRI suggesting a combination of pre- and postcapillary hypertension. He had two atrial septal balloon dilatations to relieve his PVH. The relief of the gradient was, however, short-lived as suggested by the high gradients (13 mmHg and 10 mmHg) noted at each subsequent catheter pre atrial septectomy and PA banding at 4.5 years. This could have led to chronic varying but high LA pressure due to continuously growing LA hypertension from atrial septal restriction. After surgery, he had a tight PA band with saturations in the 80s. His subsequent catheterizations (aged 5 years, 6 years, and 7 years) showed that he had high mean PA pressures (≥25 mmHg) with low mean LA pressures suggesting no residual PVH. Although the calculated PVRI is actually lower in this patient than in the first patient, the elevated mean PA pressures have been a deterrent to perform a cavopulmonary shunt. Both these patients re-presented late (9 years and 4 years), which is often seen in the developing world. In ordinary circumstances, they would not have been offered surgery (PA banding) at this age because one would expect significant pulmonary vascular changes. We can only speculate that in the first case, the PVH was paradoxically protective to the patient's developing pulmonary vascular disease, which would have been expected to be inevitable by the age of 9 years. This enabled her to undergo a successful cavopulmonary shunt at 12 years of age without any major complications in the short term. The second patient had moderately elevated PA pressures despite a tight PA band. No decline has been shown over time and this has discouraged us from doing the cavopulmonary shunt. It must be noted that that both patients had differing strategies in their management with the first patient having surgery to relieve her PVH while the second patient was initially palliated with two atrial septal dilatations that only relieved his high LA pressures for a short period. There is no data in the literature, to the best of our knowledge, on patients with a complex single ventricle with PAH having undergone successful PA banding at such a late age followed by a successful cavopulmonary shunt. We do, however, get valuable insights about the single-ventricle group with increased pulmonary flow who present late from a study conducted by Chaudhury et al. who clearly showed that even after PA banding, repeat catheterization pre-second stage repair showed that 78.3% (116/148) of the patients had mean pulmonary artery pressure (PAP) >18 mmHg and PVR >2.0 WU.m 2. They further showed that patients with a mean PAP of >25 mmHg and PVRI in excess of 3.5 WU.m 2 who underwent a cavopulmonary shunt had a significantly higher risk (P = 0.001) of death following the surgery. In this high-risk group of patients (82/148) who underwent a cavopulmonary shunt, there were 10 (12.2%) early and 11 (15.2%) late deaths. Contrary to this, no patient with a mean PAP <18 mmHg and PVR <2.0 WU.m 2 following PA band (a group that coincided with the age of PA band up to 6 months) had any early or late mortality following the second stage. Other published series also show mortality in the range of 18-45% if PVR exceeded 3 WU.m 2. These two case scenarios highlight the complexity of the hemodynamics of patients who present late with congenital cyanotic heart disease with a combination of PVH and PAH. Both patients had late PA banding with atrial septectomy with differing outcomes. The first patient was able to undergo second-stage palliation and has been well on follow-up. In contrast, the second patient with the same physiological background but with different management strategy is considered to be unsuitable for second-stage palliation so far. We speculate that the PVH in the first patient may have been paradoxically protective, allowing delayed palliation of single-ventricle physiology with pulmonary hypertension. Patients presenting with this unique physiology (increased Qp and PVH) should not perhaps be bracketed in the same category as other single ventricle physiology patients with increased Qp who present late. Patients with single ventricle and mitral atresia tolerate this hemodynamically unfavorable situation worse than those with mitral stenosis, perhaps because the degree of PVH is greater in the former. Patients with these hemodynamcis should probably be managed aggressively with more definitive treatment to relieve the PVH early on. Rabinovitch M. Pulmonary vascular disease. In: Geha AS, Hammond GL, Laks H, Naunheim KS editors. Glenn's Thoracic and Cardiovascular Surgery. 5th ed. Norwalk, Conn: Appleton and Lange; 1991. p. 1047-68. Wood P. Pulmonary hypertension with special reference to the vasoconstrictive factor. Br Heart J 1958;20:557-70. Patel H, Desai M, Tuzcu M, Griffin B, Kapadia S. Pulmonary hypertension in mitral regurgitation. J Am Heart Assoc 2014;3. Dev V, Shrivastava S. Time course of changes in pulmonary vascular resistance and the mechanism of regression of pulmonary arterial hypertension after balloon mitral valvuloplasty. Am J Cardiol 1991;67: 439-42. Adatia I, Kulik T, Mullen M. Pulmonary venous hypertension or pulmonary hypertension due to left heart disease. Prog Pediatr Cardiol 2009;27:35-42. Kiefer TL, Bashore TM. Pulmonary hypertension related to left-sided cardiac pathology. Pulm Med 2011; 2011:381787. Chowdhury UK, Airan B, Kothari SS, Sharma R, Subramaniam GK, Bhan A, et al. Surgical outcome of staged univentricular-type repairs for patients with univentricular physiology and pulmonary hypertension. Indian Heart J 2004;56:320-7. Alejos JC, Williams RG, Jarmakani JM, Galindo AJ, Isabel-Jones JB, Drinkwater D, et al. Factors influencing survival in patients undergoing bidirectional Glenn anastomosis. Am J Cardiol 1995;75:1048-50.